Offering you a complete choice of products which include organic amino acid mixture and amino acid mineral complex. 50 %. is a Liquid containing Amino acids, shot-chained Peptides derived from high quality biological origin proteins sources by controlled hydrolysis. Nutribiofert is amixture of various essential amino acids & short chained peptides required for normal growth of Plants & Animals, and is used in number of agricultural formulations like Zyme, Biostim, Amino Acid base micronutrient chelates & other plant growth promoter formulations as an organic sources of Nitrogen. These are 100 % water soluble & pH 5.0 – 6.50. 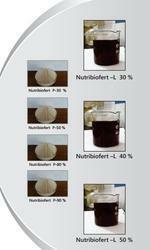 Nutribiofert L – Amino Acid mixture 50 % Liquid. Dark Brown Color Clear Liquid. 100 % Miscible in water. 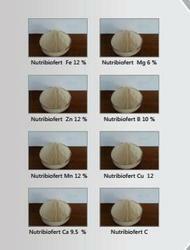 Nutribiofert L – (Amino Acid Mixture40% Liquid) Light Brown Color clear Liquid. Nitribiofert C for Spray & Soil Application.Nutribiofert C is a readymade& easily assiable source of nutrition. It helps pollination and fruit formation. Increases chlorophyll concentration and boosts the photo synthesis activity, It has a high percentage of biological value and nutritive value Nutribiofert C is available in combination (Amino Acid with all mineral) as well as individual in bulk. There are Spray dried powder. These are 100 % water soluble. Liquid :- 200 Kg in 200 Liter HDPE Drum. We also make tailor made products as per customer specifications. Looking for ORGANIC FERTILIZERS ?